The US movie “Paulie” (1998) described the adventures of an intelligent parrot who after experiencing a lot of difficulties traveling across the country to find his keeper, he was eventually reunited with her. In real life, a similar story happened to a parakeet in Japan. Luckily, this parakeet only separated from his keeper for a few days before he could return to her bosom. 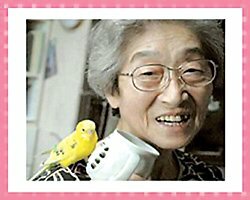 In Morioka City, Iwate Prefecture, Japan, an elderly lady living alone called Michi Toda has a parakeet named Chirotan. This parakeet has twice strayed from home. But because Ms. Toda has taught him to speak his name and address, both times, Chirotan was able to return home safely. Nevertheless, just one month after Chirotan returned home, Ms. Toda was seeing off a guest at the door when Chirotan seized the chance to dash out again. Three days later, he was found at a gas station. This time, Chirotan just simply said, “Chirotan from Morioka City.” And because Chirotan’s flight was widely broadcasted on TV, someone who saw the parakeet contacted the TV station and thus Chirotan, the intelligent parakeet, once again was returned into the arms of Ms. Toda.